Today's jaw-dropping VR hack comes not from the Oculus Rift , but the Virtuix Omni - a sort of half baby walker, half Moonwalk simulator. Between the device, the glasses and the Kinect sensor, we see some amazingly responsive (as prototypes go) tracking of Skyrim being played. Just think, a No Fast Travel playthrough could end up an effective exercise regime. 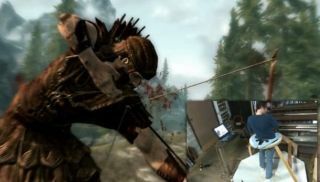 This is the second video showing the device running in Skyrim. You can see the first here . Just beware: the head-tracking sensitivity hasn't been tuned for this one. Watching the pronounced head-bob can double as a simulated motion-sickness experience. According to the device's about page: "The Omni is the first locomotion device that is affordable for household consumers, fits in a living room, and above all, enables the user to walk freely and naturally in virtual environments." Virtuix is currently prepping a Kickstarter to ensure its launch.